Andrey Klimkovsky is one of leading russian composers working in the electronic musical space. Images creating by him - "Music of Celestial Spheres", "Starry Sky", "ALEALA" and "DreamOcean" - stayed the classics of the genre, received popularity as in Russia, and abroad. 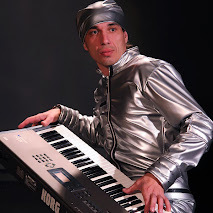 The musician plays enchanting concerts regular and collaborates with more others composers, more writes about electronic keyboards and synthesizers, takes part in astro-observations and sometimes runs the marathons.